Some Windows Fonts like Arial,Times New Roman,Verdana are very good for websites and business documents.So if you want to install those True Type Fonts(TTF) on Ubuntu 10.04 then you can do it in two ways.One most simple method is to Use Synaptic Package Manager and second is to directly copy it from microsoft windows.Both the methods are described below..choose whatever you feel easy. 1. Open Synaptic Package Manager from System->Administration->SPM(Enter your login password for authorization). 2. Type “ttf mscorefonts” in quick search bar(Located at top right corner). 3. Then mark the box in the row which is meant for Microsoft fonts installer. 4. Now,click on Apply to begin download and then installation will be automatically started within few moments(Just wait for installation to complete). 5. That’s all..Now you are ready to use the Microsoft windows fonts. You can also copy your favorite Microsoft windows fonts(TTF) directly from a windows computer(It will be very simple if you are running windows and Ubuntu in dual boot otherwise copy ttf fonts from your friends computer,who uses microsoft windows). 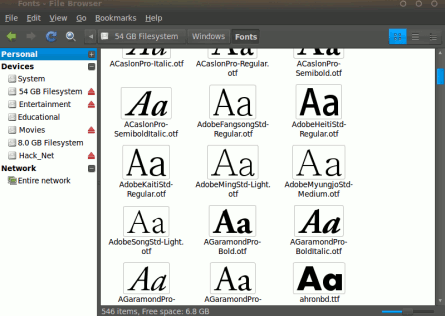 To Copy TTF fonts,Go to the drive where the windows is installed then go to windows->Fonts and select all the TTF fonts you want to install on Ubuntu and Copy it to Ubuntu’s Home in a new Folder “Fonts“.Then Rename the folder “Fonts” to “.Fonts” to hide the folder.That’s ALL..Restart the application e.g GIMP then the new windows TTF fonts() will be available for use.